The term ‘workplace housekeeping’ covers more aspects than the normal housekeeping and is very crucial and important for safeguarding the workplaces. Office housekeeping helps in preventing injuries and improving good workplace atmosphere. In many companies, it is the basic and important norm that workplace hygiene and cleanliness in the workplace should be maintained and if the parameters are not met, then the employer can be liable to pay fines for non-compliance. Workplace housekeeping should be extended to and practiced at all the workplaces like offices, warehouses, factories and manufacturing units where there is a presence of dangerous materials, dust and other flammable things. The whole idea behind the workplace housekeeping is to make the workplace a better, hygienic and safe place to work at. The importance of housekeeping has a vital role in the workplace safety program and in order to make this program successful, the employees must participate in and do the needful. 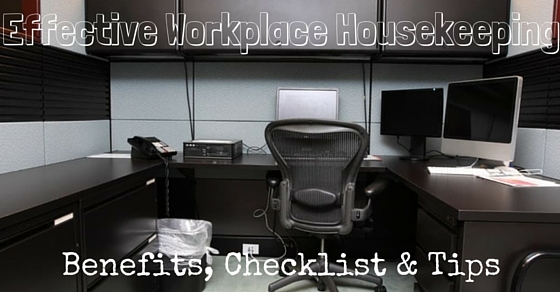 Why Maintain Good Housekeeping At Workplace? Good housekeeping holds a very important position in the workplace as it helps in eliminating a number of workplace hazards. Proper safety is also ensured by good housekeeping by implanting safety procedures in the workplace. Poor housekeeping can frequently contribute to accidents by increasing the risks of many kinds of hazards that cause injuries. If at the workplace debris, clutter and spills are accepted as normal then, in that case, there are chances for more serious health and safety hazards. Housekeeping in the workplace refers to not only cleanliness but also includes the neatness in the workplace and all workplace safety procedures. It includes maintaining halls and floors to make them free from trip and slip hazards; removal of waste materials and many kinds of other hazards. Attention must be paid to important details such as the layout of the whole workplace, adequacy of storage facilities etc. In the case where various objects at the workplace are not orderly arranged then there is always a fear of the employee tripping and tumbling over the loose objects which are scattered on the floor due to negligence in proper housekeeping or the floors or the stairs which are not properly cleaned. In case the objects are not properly placed, there always remains a fear of getting hit by falling objects. Proper cleaning and mobbing of the floors is also important as it will avoid the unnecessary tripping on the greasy, dirty or wet surfaces. Objects which are poorly stacked can hurt the employees if scattered vaguely. It helps in lesser handling owing to regular maintenance. Lesser slipping and tripping as the workplace becomes a better manageable zone due to less clutter and spilling. The exposure to dangerous and hazardous substances is reduced marginally. Improved control of materials and tools. Better and efficient maintenance and cleaning of the equipments. The overall hygiene of the workplace gets improved. Better utilization of available space. Many jobs have an open exposure to dirt, dust etc. In such cases, due steps should be taken in order to remove such impurities from the atmosphere. If it is not possible to clean the dirt and dust manually then in that case, proper machinery or ventilation plants should be installed in order to make the environment clean and fresh. By using such kind of high capacity cleanliness machinery which comes with special fittings, aids in cleaning walls, machinery, ledges etc, it is always easy to maintain a clean environment. There are available special kind of vacuum cleaners as well which helps in removing the hazardous material; they should be used when and where required. There are many numbers of facilities which are provided to the employees. Washrooms, lockers etc are some of them. It should be made clear that the washrooms are cleaned multiple times in each shift, also it is important to make sure that there is adequate supply of toiletries in the washrooms. In the case where the employee are exposed to hazardous materials, adequate facilities should be provided which includes showers, changing rooms, washing facilities. It is the obligation of the employer to provide the necessary facilities and take proper care of their employees. It should be seen to and made sure that in the case where there is an exposure to toxic materials; there should be no smoking or drinking. A separate cafeteria/canteen should be provided in such cases which should be timely cleaned. Floors, walls etc should be kept neat and clean in order to avoid any kind of unforeseen danger. Where the floor conditions are poor, there stand chances for many kinds of unforeseen accidents. It is mandatory and important to clean up the spilled oil, water or any other kind of liquid immediately. Where there has been a cleaning done recently, there should be a signage put up warning the employees about the wet floor. In the case where regular cleaning cannot be done, in that case the flooring should be made anti skid. The walls should be colored light in color as it helps in reflecting light. The lightning source should be cleaned from time to time as a cleaner source leads to better lightning. The dirtier the lightning source is, the dingier the work place would look. The aisles and staircases are one of the places wherein no unnecessary materials should be dumped. These places should be kept neat and clean as messing up here means disruption in the free movement of the employees. Also, in the case of emergency, if these places stay cluttered and piled up then it could lead to a major problem as those who are getting affected would not be able to move freely. Also, in the case of blind corners in aisles and staircase or the corridors, mirrors must be used in order to ensure safe movement. Regular cleaning and maintenance should be implemented in order to avoid the hazards which can arise from spill damage. It should be taken care that the employee are using drip pans, safety guards etc wherever necessary. The tools and equipments should be properly marked and stored. It should be seen that after the use the tools and equipments, they are safely returned. A regular inspection, repair and cleanliness are some of the aspects to which attention should be paid. Maintaining buildings and equipment is one of the most important element of good housekeeping. It should be taken care that the equipments, buildings, machinery etc are in good and operational condition. Time to time repair and maintenance are required and should be made in order to keep them in a proper condition. It should be made sure that there are no broken windows, defective plumbing, damaged doors, etc. as all this makes the workplace a neglected place and vibrates negativity around. Waste disposal or the scrap management is yet another important element of waste management. The unnecessary material or the scrap should be disposed of properly according to the regulated manner. There are certain standards which are set up by the lawmakers which need to be adhered to at the time of disposing the waste. For many kinds of waste, there are scrap management companies which buyoff the scrap from the industries. Proper storage is one of the aspects which should be looked into in order to maintain a clean and healthy workplace environment. It should be taken care that there remains no unnecessary spillage, or clutter at the workplace, as all this leads to unforeseen accidents. It is very important to store the stack drums and cartons on a solid foundation; they should also be tied in order to avoid falling down. The flammable, toxic and hazardous materials which can cause accidents should be separately stored and the area should be marked as dangerous. Normal entry of others should be prohibited. The following mentioned are few housekeeping tips and housekeeping safety procedures that are to be maintained for making a workplace effective. All due measures must be taken in order to avoid slips, trips and falls at the workplace. Proper and timely cleaning should be done and the cleanliness should be maintained. For the purpose of preventing trips and slips, the aisles should be kept clean; the damaged and ripped flooring should be replaced. Proper signage should be used in case of wet floors. In addition to the above measures, anti skid mats and should be used wherever required. Dust and dirt should be removed from time to time and proper precautions should be taken to keep the work neat and clean. Professional vacuum cleaners should be used to maintain proper hygiene at the workplace. The materials which get stored at the workplace should be done so properly. This helps in removing the unnecessary clutter and also eases in finding out the material easily in case of need. A proper workplace is one wherein every material has a designated place to be parked and once done so; it makes the life of all those employees who use those materials a little better. Those responsible of cleaning up the workplace should themselves follow certain standards and should be safeguarded against any kind of causality. Proper precautions and ethics needs to be followed herein. Such safety measures may differ in various workplaces but one thing which stays the same is that these measures must be followed diligently. Each and every worker should be incharge of keeping their own working area neat and tidy. If possible, they should report the safety hazards as soon as possible and should clean up the spills in their work area. If each individual becomes a little vigilant and participates in keeping the workplace neat and clean, then a whole lot of resources of the organization can be saved. Like other policies in the corporate, the housekeeping ones should also be well defined and written. This in turn would make the person responsible to follow them in line. Once the protocols are set and the rules are written it becomes easy to follow them. Housekeeping needs to be an ongoing process and all due measures should be taken to maintain the sanity of the workplace. Regular audit, walkthroughs and inspection schedules must be put in place which would in turn help in sustaining good housekeeping. The floors should be kept clean and clear. The workplace should be adequately lighted. The light fixtures should be clean. The machinery and the tools should be inspected regularly. The spills should be cleaned immediately. Do not use the staircase or the aisle as a storage area. No material should be allowed to be built up on the floors. The emergency exits shouldn’t be blocked.